Having teased its technological attributes and appeared at the Spider-Man: Homecoming premiere, Audi’s teaser campaign for the new A8 flagship sedan is in full swing ahead of its debut in Barcelona on July 11. This latest Spider-Man themed video takes aim at Audi’s luxury rivals, highlighting a comfort feature it hopes will entice buyers away from the Mercedes S-Class and BMW 7-Series – a “relaxation seat” with a built-in foot massager for rear passengers. In the video, a kid dressed up as Spider-Man leaves his father tangled up in webs in the back seat of the A8. Unperturbed by his predicament, the father uses a central touchscreen located between the rear seats to access the stress-relieving massage function. Activating it releases a panel built into the rear of the front seat revealing a surface that gives occupants a relaxing foot massage. Passengers will also be able to adjust the intensity of the massage using the touch screen, as well as select “wave” and “stretch” options. Audi hasn’t detailed exactly how the system works, but it will only be available in the long wheelbase ‘L’ version of the luxury sedan. There’s now only a week to go before Audi lifts the wraps off its new Mercedes S-Class rival, but you’ll be able to see it in Spider-Man: Homecoming on July 7 in scenes of shameless product placement demonstrating the A8’s autonomous abilities. 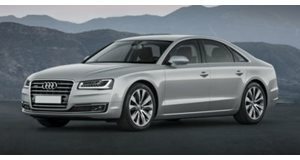 Audi has yet to reveal the specifications of the new A8, but has confirmed it will feature a 48-volt mild hybrid system that reduces fuel consumption by 0.2 mpg. In addition to the foot massager, passengers riding in the new A8 will travel in crisp comfort thanks to a front mounted camera that can detect bumps in the road before you hit them and adjust the suspension accordingly.